The Chesapeake Bay is known for its blue crabs, but those crustaceans are far outnumbered by much tinier residents: bacteria. Every milliliter of bay water is home to thousands to millions of these marine microbes, critical building blocks of the bay's ecosystem. To protect these ecosystems, scientists want to understand how these bacteria feed themselves. Now, a team of researchers from the University of Delaware have uncovered that about 40 percent of Chesapeake Bay bacteria utilize sunlight as a source of supplemental energy. Their results are published in the July issue of Applied and Environmental Microbiology, and a photo from their studies is featured on the journal's cover. Bay bacteria feed on nutrients dissolved in water, such as carbon, which is produced as plants and other organisms decompose. However, some bacteria in the bay can also harvest energy from the sun using rhodopsin, a light-sensitive protein also used by the human eye to process light. Rhodopsin-producing microbes use light to generate chemical energy. "For a long time, we thought of this system like backup generator for the cell, a way for the bacterial cells to get energy from sunlight when they didn't have enough organic carbon available to generate the amount of energy they need," said Julia Maresca, an associate professor of civil and environmental engineering at the University of Delaware. Her findings are shifting that paradigm. "Light is not a backup generator, but rather a commonly used bonus source of energy for a lot of bacteria," she said. "They don't have to have it—they operate just fine in the dark. But when they have it, it gives them additional capabilities." 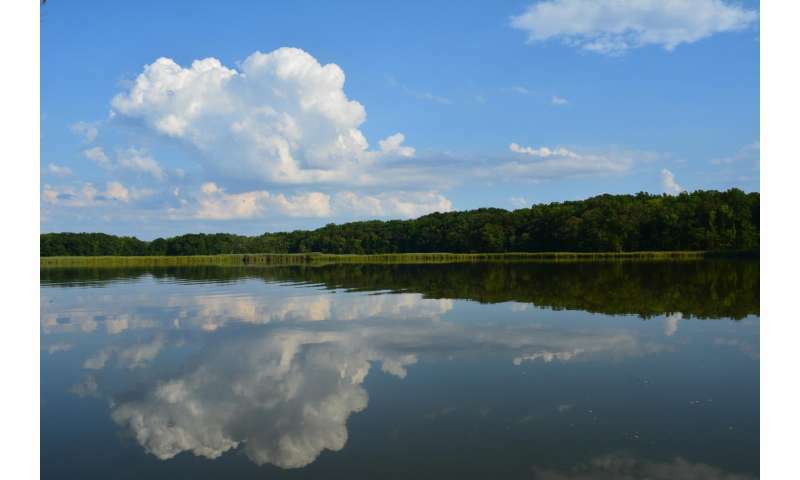 To figure that out, the team studied bacteria from the Chesapeake Bay, which is rich in carbon, as well as other nutrient sources such as nitrogen and phosphorus. "These microbes are not starving, and so they really don't need a backup generator, but a lot of them have this type of very simple photosystem," said Maresca. Maresca and her team first collected samples during a five-day cruise along the Chesapeake Bay from the Susquehanna River to the Atlantic Ocean. They dropped collection bottles at both 11 a.m. and 11 p.m. each day. Previous research had suggested that up to 90 percent of the microbes in the Chesapeake Bay might have the genetic material to make rhodopsin. Maresca's results were consistent with that estimate—but not all the bacteria with the genes to make rhodopsin actually did. "What we did that hasn't been done before is identify how many microbes are actually making rhodopsin," said Maresca. "If they have the gene, they have the potential to make this system, but in the past, it hasn't been possible to figure out how many cells are actually making it." In order to determine that, researchers had to be able to pick up a very faint marker in the bacterial cells. Maresca worked with Chandran Sabanayagam, an associate scientist at the Delaware Biotechnology Institute and expert in atomic force and single molecule microscopy, to develop a detection method. They used total internal reflection fluorescence microscopy, a method that has been long used to examine proteins but hadn't yet been applied to natural systems. The results were a surprise. "We thought we would see that as indicators of bacterial starvation increased that we would see more use of light," said Maresca. "What we saw was pretty much the opposite." The bacteria produced rhodopsin more often in the presence of algae and other carbon-producing organisms. They also produced more rhodopsin in saltier water closer to the ocean compared to less salty water closer to the Susquehanna River. In total, about 40 percent of the bay's microbes produced rhodopsin, the team found. "We actually think that what's going on here is instead of using these rhodopsins as backup generators, they're more like the solar panels that let you sell energy back to the grid," said Maresca. "It's a bonus instead of a backup, so it gives them the capability of doing more stuff than they would ordinarily do." More research is needed to determine what the bacteria do with the extra energy, but it's plausible that they could use it to fetch more nutrients or even to swim. Studies like these are also important because they offer insight on where some of the sunlight that hits Earth goes—since less than 1 percent is captured by plants for photosynthesis, said Maresca.